Unofficial Coventry Rugby - Who Are Ya? Oh yes, Hartpury. Who Are Ya? Oh yes, Hartpury. If Premiership players can't do it, who can? Hartpury came to the Butts today, somewhat cynically loaded with nine Premiership squad players from Bristol, Gloucester, and Worcester, and, it has to be said, at times looked like the settled team of the two on the claggy old Butts pitch. 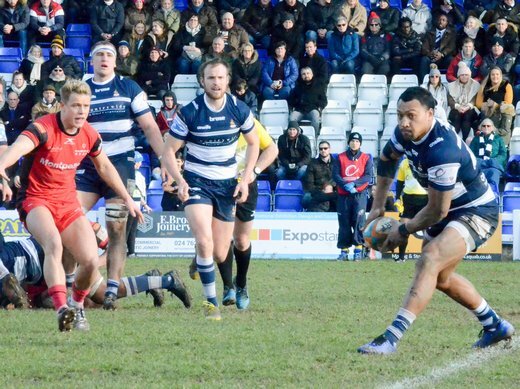 Virtuoso performances from full-back and scrum-half threatened to unpick the Cov defence time and again, and a solid pack showing didn't exactly hold them back. In contrast, for probably the first threequarters of the game, Cov looked disjointed, and were probably fortunate to get the better of the early exchanges - points-wise - and go in 7-3 to the good at half time, through a well-worked 13th minute try finished off by Rob Knox, and a superb touchline conversion by Will Maisey in the swirling wind. That though was about it for the Blue & Whites, who seemed to lack a certain spark in almost every facet of their game. Hartpury's sole penalty goal on 35 minutes was probably scant reward for their efforts, but it must be said that few chances went either way with play concentrated between the two 22s. It didn't improve any in the early exchanges of the second half, with the visitors executing a series of accurate pick & goes resulting in a converted try on 55 minutes to take it to 7-10, with Cov and their supporters looking somewhat dejected. This, and possibly a few tactical changes, seemed to gee the home side up, and during the final quarter they began to look like a side who knew how to play rugby, with some searing breaks from the back three, and generally a much stronger set-piece performance from the pack - even if the lineout remained unconvincing at times. I do wonder how Messrs Deacon and Stankovich approached their post match interviews. 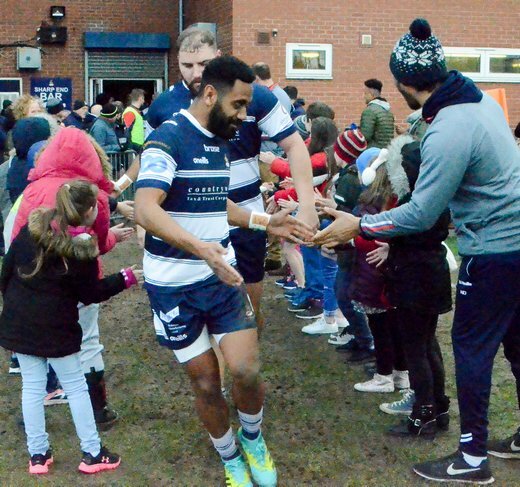 A try on the end of a thing-of-beauty maul from the 22 for sponsors Man of the Match Scott Russell put Cov ahead by 17-10 following another Maisey conversion, and suddenly things looked slightlier rosier, and a sense of belief seemed to take the place of the earlier jitters. This was the Cov Dog baring its teeth once again, and it felt good. 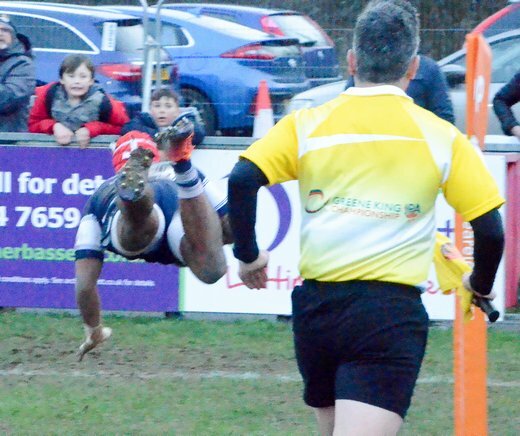 And then, following an excellent move, Junior Bulumakau was released on the right wing to finish with a trademark dive, and with the conversion and full-time looming, Cov suddenly looked totally in charge at 24-10. But... we all know how it works by now, and Hartpury once again found themselves in a position to drive it over, pickup by pickup, under the sticks. All just too late though, with Mr Doyle pointing to the changing rooms following the successful conversion, which made the final score 24-17 to Coventry. A 4-1 win then. Enough to secure Coventry their place in the league? Who knows, but it seems likely. Satisfyingly, they now draw level with Nottingham in the Championship, but with Nottingham having a superior points difference. That fact alone makes it feel like we are once again looking up the table rather than down, and I'll take that. I'll leave the usual statisticians to fill us in on the facts and comparisons with previous seasons, but it has to be said that it's looking fairly rosy, all things considered. Hartpury, however, are still not in a happy position. A bonus point may have helped them close the gap slightly on Richmond, but they needed a win to give them a clear view of the survival lane. And with Scottish gaining an excellent win in Jersey, and Leeds on a roll, it's increasingly looking like a fight to the death between the current basement two. Cynical ploys aside, I know who I will be rooting for as the drama unfolds, and they don't play in Gloucestershire. 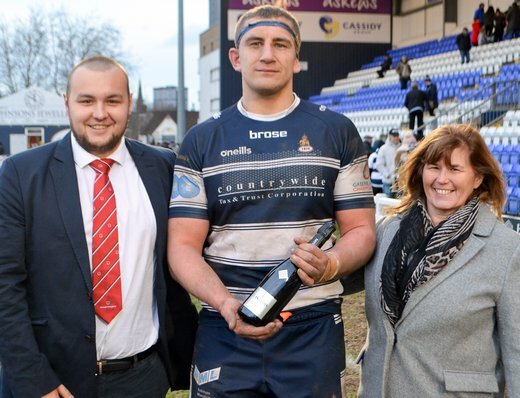 Coventry Unofficial Man of the Match: George Oram. Strength of a bull, carried like a Pickfords lowloader. Edited 1 time(s). Last edit at 2019:02:12:13:21:46 by AdminBTCov. Re: Who Are Ya? Oh yes, Hartpury. Fair assessment, Oram MOTM for me. We could have easily been on the reverse of a 4-1 today, we’ll play/have played better this season and lose! Edited 1 time(s). Last edit at 2019:02:09:20:24:10 by CovBlueLou. Agreed JB. Tough for them. Hopefully. A really dismal game to be honest. Box kick to you and box kick back to me. If Tom Kessell is being told to do that, then he looked pretty fed up when subbed. 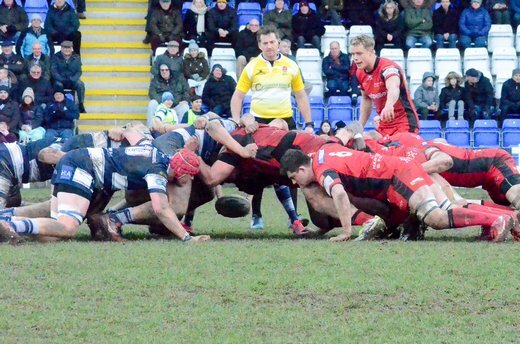 Fantastic tackling all afternoon from Cov against a combative Hartpury side. 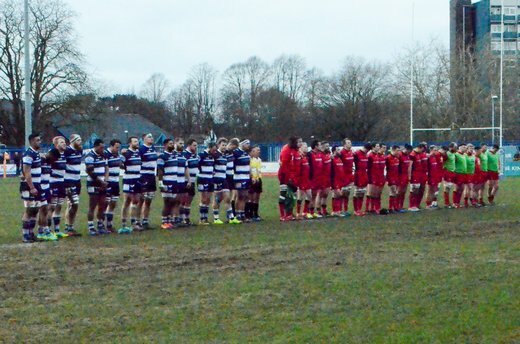 At 60 minutes Hartpury looked the confident side and the crowd was silent. The bench came on and at last we stopped the bloody box kick and played and passed with pace to players running onto the ball and not static and got the crucial couple of tries to win the game. I thought Cov looked desperate to win and, as a result, played a disjointed game against some dogged opposition which had all the hallmarks of a Rest of the World XV. The cynical addition of those extra players to the Hartpury squad makes me certain in my hope that it’ll be they who get relegated, and not Richmond. Which makes Hartpury’s game against Richmond in London next week a real bum squeezer. So, excercising my old-age-negativity, I’m rooting for Hartpury to be relegated from the Championship and Bristol from the Premiership. Yep. Lewis (I only alluded to changes - I perhaps could have expanded) certainly helped change the shape of the game. We have a gem that doesn't need too much polishing there, so let's see how he progresses. There are exciting prospects all over the shop just now. Hopefully they'll stay for the journey. England showed how effective the kicking game can be last week. Unfortunately Cov are really poor at dealing with the high ball which makes the style of play they adopted on Saturday totally pointless. I think maybe the significance of the tie seemed to get to the players. 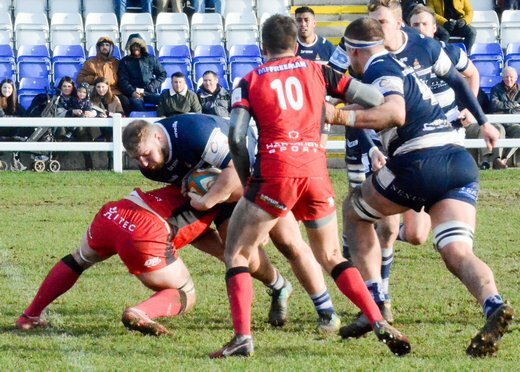 There was nothing to lose against Bedford but the possibility of putting further distance between us and the bottom of the table appeared to stifle ambition. I thought we were pretty poor yesterday and looking down the throat of a defeat in the second half. Players coming off the bench seemed to make a big difference especially Pete White and Dan Lewis as already mentioned. But also, and not for the first time in recent weeks, Latu Maakafi! His passion for the game and the Cov jersey is immense. I find it hard to recall an occassion when he hasnt put in a shift and was fired up in the rolling maul that resulted in Scott Russells try. George Oram seems to be a MOM contender every week and put in another grafting and bruising shift. A worry that he is out of contract in the summer and no news of him signing? defenses seemed to be on top for much of the game which meant that what little ball cov secured they could not use to speed up play and bring the backs into the game. too many penalties conceded & line lost or spoilt was really frustrating. credit to the team for grinding out a win after managing to get some good field position from scrum dominance on the last 15 mins. standouts were oram , tolmie & adams who i thought had a cracking game in defence & attack. jubbs arrival for the second half improved the lin eout. kessel put in a good shift covering & organising well and making a few breaks, and mention also for maisey whose conversions & penalties , some from wide out, made a big difference. finally another +2000 crowd and the pitch whilst far from perfect held up wel, despite the rain overnight. Given that we have only so far heard about 2 re-signings, I'm not sure there is much to be concerned with, is there? Unless you know something we don't. Edited 1 time(s). Last edit at 2019:02:10:19:55:46 by PaulRossborough. And how refreshing that there have been no negative comments about the officiating.. shows what a difference a good and experienced ref makes!! A tentative Cov and a subdued crowd for the first hour. Poor decision not to take a fairly easy 3pts to take us 10up. The kick for corner and resulting lineout was one of a number lost during this period. Thereafter we struggled to get our hands on the ball and when we did, it was given up too cheaply. The penalties conceded tally was again too high. On the plus side, defence was good and Hartpolshire never threatened our line first half. With 20 left, we finally played to our strengths - we took territory through the forwards - Oram and Jubb outstanding - and the backs put pace on the ball. Frustrating it took so long to work out. Even with their mercenaries, Hartpolshire will take the drop - across both games we have made them look better than they are. Missed a fair bit of offside though - Touch Judges still don't help refs enough in this important area of the game. It’s true he did let some offsides go unpunished, but he applied that leniency to both sides because Cov were as guilty as the Rest of the World team. In my opinion, JP was as good a ref as we’ve seen for a long time. He was excellent at Bedford and was no less good on Saturday. Yep - no intent or bias - can only have one line of sight - hence need for pro-active TJs. Some referees don't want (or need) "help" from their AR's. Whether JP needed (or wanted) it would have been covered in hi sbrief to the AR's pre-match. Also, I'd venture that those guys were probably in a better position to judge whether a player was offside and interfering or not. I'd also venture that they are in a better position but still appear to ignore the offside line. A well-respected ex international pundit has also highlighted the fact that ARs need to flag up offside more often as it's stifling attacking rugby.